Wednesday was our first Cruiser Day of the summer, and it was a doozy! Cruiser Day is a cabin day that typically falls on Wednesday at camp. It is a break from our normal routine, and the kids and counselors of each cabin get together to put together a plan for their whole day. The activities can range anywhere from our normal camp activities to the goofiest and most creative things our staff can dream up. Each Cruiser Day starts with breakfast in bed and we feast on some delicious doughnuts. From there, we do our biggest cabin cleanup of the week. Everyone changes the sheets, mops the floor, and we send out the laundry. As if that wasn't enough fun for one day, then we get into the activities. Kim McCormack helps to make sure that there's an array of fun activities for the cabins to participate in, and they take on all kinds of things. 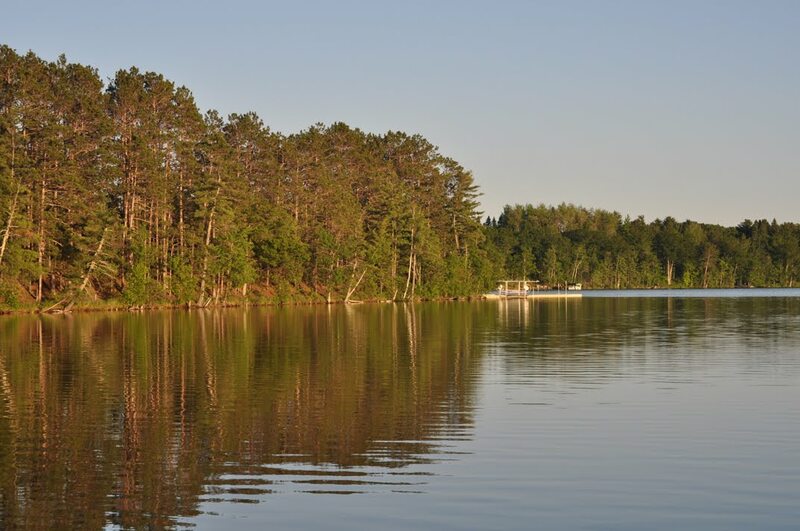 Many cabins enjoy going tubing and waterskiing. This week they could go slip-and-sliding on the athletic field, and even made home-made Chia Pets in the Arts and Crafts. Our J-4 counselors arranged a "Survivor" Day filled with immunity challenges and all. You knew they meant business when counselor Scott Diebel came out with dirt-war paint. It was the Village Cruiser Day for the Intermediate Village, who took full advantage of their field trip by heading to the Wild Mountain Water Park in Taylors Falls, MN. They were also joined by cabins J-6 and J-7. They enjoyed the waterslides and the alpine slides there before coming home. Every Cruiser Day ends with a cookout dinner, where each cabin prepares their meal over a campfire. There is a campsite for each cabin, and they build the fire, prepare the food, and feast in the luxuries of the great outdoors. This week we prepared everybody's favorite - Tin Foil Surprise. It's a combination of ground beef, potatoes, carrots, onions and topped with cheese. You wrap it up in Tin Foil, and the outcome is the delicious surprise! Dessert was the traditional yet scrumptious S'mores. We're looking forward to many more great Cruiser Days! We take great pride in our camp and our program, and today we were able to show it off. Every three years, we undergo our accreditation review through the American Camp Association. This process involves evaluating North Star against the ACA's standards for safety and care throughout our whole camp program. Not to brag, but we far exceeded expectations! We passed our review with flying colors, but thanks to Sue's hard work, that was never in doubt. One of the nicest parts about the process is that we use it as an opportunity to be constantly improving camp. And as we call attention to some of the nitty gritty details about camp, we should call attention to the hard work of Sue (on health and safety, maintenance and beautification, overseeing the kitchen and staff training) and Dan (on putting together the program, and great work with our HR department). And we also should call attention to the great efforts of all the people at camp who work behind the scenes. Our kitchen staff and maintenance staff work tirelessly to keep our campers safe and happy, and their efforts are greatly appreciated! Tonight, the whole camp gathered by village for our first village campfires of the summer. As is tradition, the entire Junior Village played a game called beach flags. Beach flags is a game where the campers lie down and feathers are placed behind them. One less feather is placed than campers present, and thus, after each round, one camper is eliminated. The goal of the game is to be the final camper standing. First, each cabin played their own game; next, these winners represented their cabin in the final Junior Village match. When the dust settled, Clarence W of J2 became the winner. After beach flags, the entire Junior Village joined together in the making and eating of some tasty s’mores. The Intermediate Village kicked off their campfire with a game of Svetlana ER. At this point, you're most likely thinking to yourself, "what in the world is that?!" And with good reason. It is a combination of dodgeball, bocce ball, and chaos that combines for a ton of fun. The game is truly proof of what a blast the kids have as a result of the creativity of our staff. The Ridge sang some songs and finished up with s'mores as well. Cabins S-1 and S-2 had a Senior Village Campfire of their own, which featured some stories from their respective trips and some campfire games. And of course s'mores. On the whole, the Village Campfires help to build a great sense of community and show off the talents and creativity of our guys! Cabins S-1 and S-2 are now back from their hiking trips through the Porcupine Mountains! With their return comes a special guest blog from tripper Kacy Lebby, sharing a trip report and some great pictures. We left Thursday morning, it was 55 degree and raining as we headed up to the Porcupine Mountains in the Upper Peninsula of Michigan. The second day we hiked eight miles along the beautiful (but buggy) Little Carp River slowly but surely making our way closer to Lake Superior. As the day progressed the clouds began to lift, and just as we reached Lake Superior the sky was cloudless. We laid, played and hung out on the beach on this beautiful afternoon while our things dried out from the previous day and half. Our third day we had a lay over day where we slept in and cooked M&M pancakes. The kids enjoyed the short two mile hike to the Shinning Cloud Falls and meeting up with the other cabin, S2. That night we had a wonderful fire on the beach and slept directly on the shores of Lake Superior. The next day we hiked along the shore for several miles, then spent several miles in a boggy and muddy mess. The group kept up their spirits by singing songs- Sweet Caroline and All Star to name a few - while our hiking boots sloshed in the thick Michigan mud. Our final day involved a 2-mile uphill hike to finish the trip. It is safe to say that the first session backpacking trip was a huge success, and one that those involved in will surely not forget! Both cabins had a blast on the hiking trip! Thanks to our counselors and trippers for making the experience a special one! As is tradition on Friday nights, we gathered at the Council Ring for our first Friday Night Service of the summer. Every Friday the whole camp gathers for a value oriented campfire program, and the first one each summer is called "The Friendship Fire." We hold friendship as one of the most important values at camp, and it is no mistake that we talk about it first. At the Friendship Fire we talked about the history of camp and Leb told the story of how Lou and Renee Rosenblum came to found North Star on a resort that was called "U Need A Camp" in 1945. The importance of those camp friendships has carried through since then, and we take great pride in the way that members of the North Star community treat one another. Tonight Jason Versteeg, one of our counselors, told a great story about his first friend that he met at camp and the special relationship that was born from sharing a tent during their first summer. Jason did a wonderful job explaining how a real friend is always there in times of need, and how a real friend loves you for being yourself, no matter who you are. The Camper and Counselor Chorus played a few great songs, we shared a few poems and readings, and with Jason's help, we began to realize just how lucky we are to be surrounded by our great North Star friends! For tonight's evening program, we decided to unlock the potential of our supremely talented campers. The result: Bieber Fever! We announced that tonight's evening program was going to be a skit show in Mike Hall, and each cabin was going to put on a performance for our judges. 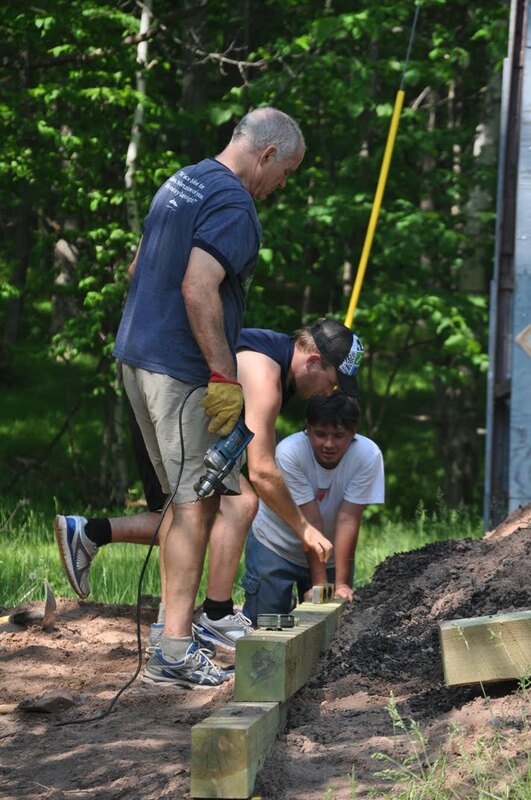 Each cabin was given some time to prepare before they put on their best work in front of camp. First up was cabin I-6, who did their best dancing and singing to Justin Bieber's hit single "Baby," while also adding in a couple of gymnastics moves. Next up was cabin I-4, dancing and singing to the tune of "Baby" by Justin Bieber. They performed a very well-choreographed routine which involved "rocking the baby" and then holding their arms over their head in the shape of an "O" corresponding perfectly to the lyrics. Next up was cabin J-2, who came out in their hooded sweatshirts and performed solo acts to the song (wait for it...) "Baby" by Justin Bieber! These guys chose to perform solo acts by each verses, and it was clear that even our youngest cabins have this song memorized. From there we heard a little Katy Perry, a few YouTube sensation knockoffs, and even a Lady Gaga remix, but it was clear that North Star has succumbed to Bieber Fever. Our first full day was a great one in the Northwoods! The rain held off enough to let us get in an action packed day. Before we get into our regular programming tomorrow, we first had to take care of a little business today. Each camper today went through the Camp Advanced Swim Test and a health check, and more importantly spent the day getting more familiarized with his cabin, his village and the staff. Evening program was our opening night staff show. Our staff put on a great show with a mix of musical and comedic acts that had Mike Hall abuzz. While the staff show is very entertaining, it also serves to make sure that all the campers are familiar with each staff member, as they will interact with them throughout the summer on various activities. While the night was through then for most of our boys, our oldest group was preparing to leave for Canada. Tomorrow morning, they will take off on their 9-day journey through Quetico Provincial Park in Ontario. 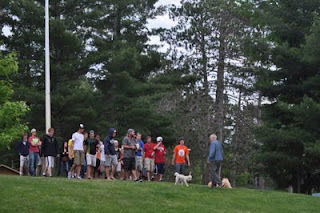 They did some training today along with packing, and the group also gathered at Leb and Sue's house for a proper send-off. We talked about the significance of the trip and previewed just how much fun these guys are going to have. We're so excited for them and can't wait to hear the stories when they get back! With the crack of thunder, we were off and the Summer of 2011 was underway! The storm in Chicago was loud, though you could hardly hear it on the bus as the noise of excitement filled the bus. As we drove North, the storm relented, but the noise did not. Old friends were catching up and the new campers were hearing stories of what’s to come. A crew was stationed at the Minneapolis to pick up the boys arriving from all over the country, and even some other countries. And as excited as they were, none of them knew what was really waiting for them at camp. Since we started our pre-camp orientation, it has been easy to see just how much fun this staff is. Their enthusiasm has really been contagious, both while learning and while playing. Many of these guys are returning for their 8th, 9th, or even 10th summers and have been helping spread the North Star love. And the new guys have jumped right in. The first night that the whole group was together, a few of them taught the whole staff a new game that had everybody laughing and singing for hours (you can actually see some parts of the game on video on Leb’s Ramblings). That staff energy was on full display as they jumped for joy when the kids arrived. 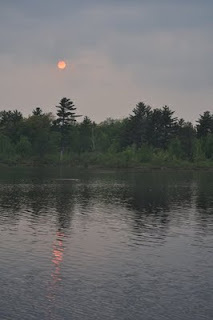 We gathered around the flagpole with the sun peeking through the clouds, and the campers and counselors alike went crazy as the cabins were announced. The kids have now unpacked and new campers have been given a tour of camp. By the time they go to sleep tonight, they’ll have played games with their cabins and met some of the other guys their age as well. Dinner this evening will be burgers, fries, jello, salad and the ever present peanut butter and jelly. There will be vegetarian burgers available for those that prefer, and brownies for dessert. The pre-camp food has been delicious and I believe your boys will be well fed this summer. by their counselors to share their goals and expectations for the summer. This will be the first of many cabin discussions that are an important part of the "team" building goals that we have for each cabin group, and helps develop the strong sense of community that we strive for at camp. Tomorrow the kids will have a busy day as they get checked out by the medical staff, take a swim test, choose their 1st week’s schedule and find time to play several games of dodge ball and capture the flag. Then tomorrow evening will be the staff show, where our very talented group will be on display. Whether musical or comedic, we have found out that this group can put on a show. This past Friday, one of Hayward’s contestants for Musky Queen joined us for lunch in an attempt to raise money for charity by selling buttons. The inner lodge was roaring as the guys serenaded her with songs and cheers. She expertly fended off date requests in various forms as Ari Shifman and Jacob Sherman tried to out-cheer one another for her love, Josh Gilford tried to buy it in buttons. She sold buttons like they were made of gold, but was only made to blush when Nick Kasle decided that the fastest route to her heart was by showing off his muscles. This was just another display of the creativity and enthusiasm of this group. Since they arrived, they have impressed us with their maturity and thoughtfulness, keeping us laughing hysterically all the while. We are very confident that this group will help make it an awesome summer for your son. Our overnight trip program begins with a roar on Wednesday when our oldest campers leave for 9 days on their Canadian camping trip. Throughout their camping careers they have taken cabin trips with their bunkmates ranging in length from 2 days when they were younger and then went on 3 and 4 day trips before the Canadian adventure this summer. We'll tell you more as the summer progresses. This is the first of a series of Letters that we call "Leb's Ramblings." They will be posted on the website at www.northstarcamp.com in the The Lodge under the Media Room and called Leb's Ramblings. 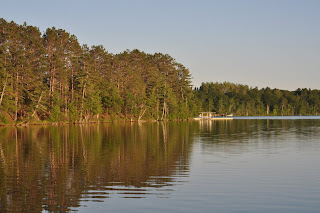 You can also access the site directly at www.northstarcamp.com/blog. We post pictures online on a regular basis, and starting this summer you will be able to access those from your CampInTouch page. To access your CampInTouch page, go to www.northstarcamp.com and click "login" in the upper right hand corner. From there you can click on "Photos" to see those smiling faces. If you’d like to set up guest accounts for friends or family you can do that from your landing page by clicking on "Guest Accounts." We Can't Wait for Camp to Start! Tonight marks the official start of our pre-camp training week. The rest of our new staff arrived today as did all of our CITs. Training began with dinner and the first major lesson for our new staff was to teach some of them the horsengoggle. This is North Star's way of equitably dealing with extra desserts, amongst other things. In the picture you can see Leb taking our new staff on their official tour of camp. 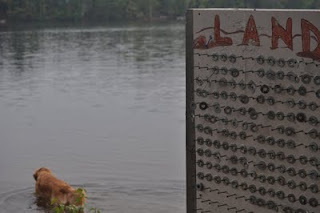 While some have been here for upwards of a week the tour with Leb is a great way for them to both see all of camp but also learn about some of the history of this place. Tomorrow the rest of our returning staff members will arrive (with the exception of a couple of stragglers). Our JCs always add a lot of energy to the staff and pre-camp. The quiet of our off season is officially over! In Wisconsin, if you don't like the weather, just wait a few hours. Over the past week we've experienced quite the temperature roller coaster. Like many of you, we had unseasonably hot days Monday and Tuesday, with temps into the 90's. We were remarking at that time how unusual it was for it to be that hot and that most pre-pre camps we'd have a fire going in the lodge fire place and hot cocoa for our staff. Well, two days later, we had a fire going in the lodge fire place and hot cocoa for our staff. Timing, of course, had a little fun with us. The drop in temps was coincidentally timed with the start of our life guarding course and the set-up of our swim point (which required people to get in the water for our dock placement). Some strategic planning by our life guard instructor Mandy made it all work out perfectly, however. All of our life guards did their swim this afternoon when the sun was out and temps had again reached the upper 60's. Tomorrow it supposed to be even warmer. 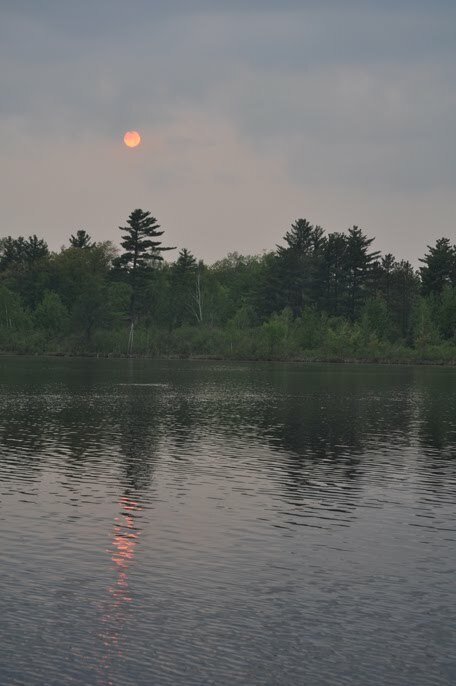 Hopefully today's picture captures the perfect early June Northwoods evening. Brewer's Bay is like glass and the setting sun has illuminated swim point, which is eagerly awaiting the arrival of the aqua launch. Things get even busier tomorrow when the rest of our new staff as well as our CITs arrive. Then Monday we welcome our returning staff. We have no cleaver line today. No real narrative on today's picture... just one that I took a few days ago that I wanted to share. Our group here is growing. We are now half way through our life guard course, with 20 people getting certified. Much of our administrative team is here and the final member of our kitchen staff arrives tonight. Over the past week we've experienced the weather ups and downs of much of the midwest. Temps were near record highs early this week as we reached the 90s, and then of course, the evening before our life guarding course was scheduled to begin temps plummeted. Only one of the first two days required the life guards to be in the water, however. 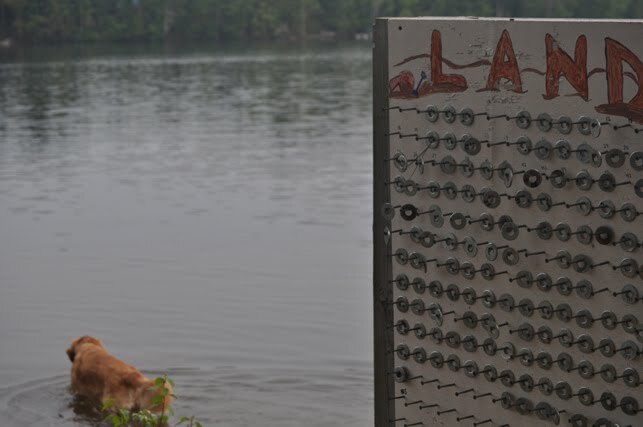 Mandy Stanek, who is instrucing our life guards was nice enough to reschedule the course a bit so that they could do most of their lake swimming tomorrow and Sunday when its supposed to warm up into the 70's. When life gives you lemons... 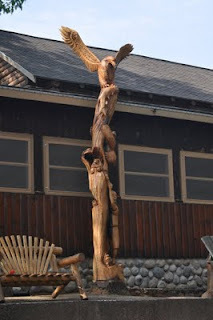 Carve a totem pole? Last year right around this time we realized that one of our oak trees in front of the main lodge was not doing so well. We had the tree service come in and we came to the conclusion that it couldn't be saved. We could have simply removed the tree, but it gave us the opportunity to create something. 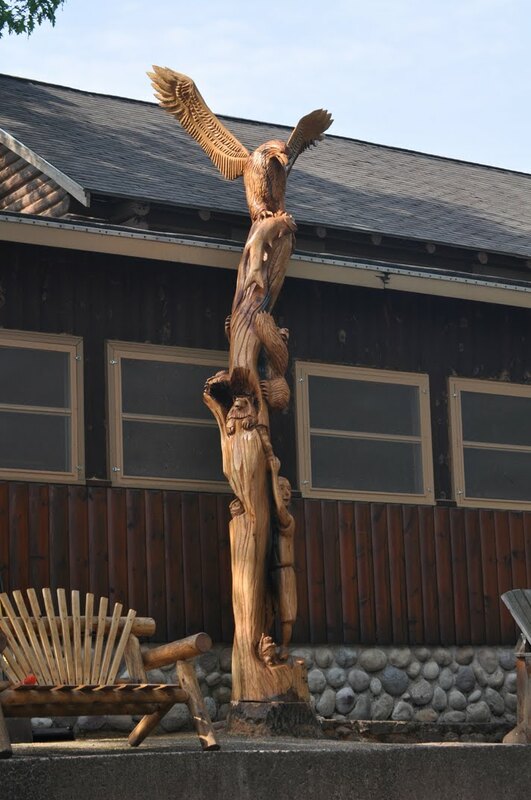 So they left much of the tree and a wood carver from nearby Seeley, WI named Tim Thoresen came in and got to work. Tim did the same a few years back when a tree near our maintenance shop had to come down. As you'll see below, there are many elements in the carving. It took Tim less than a week and much of his work is done with a chain saw and other power tools. Here are some more pics of the new wood carving. Over the past several years, disc golf has become one of the more popular activities at North Star. The program started with a temporary basket brought to camp by our resident disc golf pro (and CIT Director) Jeff McCormack. Eventually we got our first set of baskets, then replaced them with higher quality ones. Now campers bring their own discs to camp and play year round back home. The course at North Star has changed, too. Jeff changes it up and this year is no different. 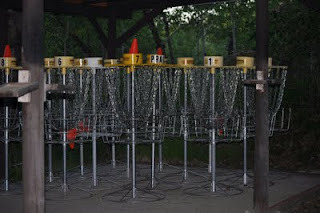 He decided that, in order to ensure a higher level of success for our campers, and more aces, he'd just have one hole with all of the baskets right next to each other. 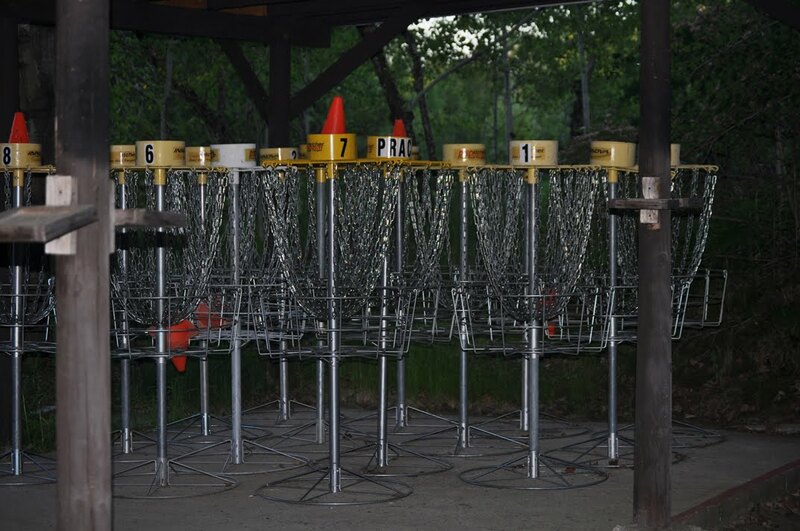 This way disc golfers are bound to end up in one of baskets. In reality, this is how we store our baskets over the winter... protected under the roof of our rifle range. 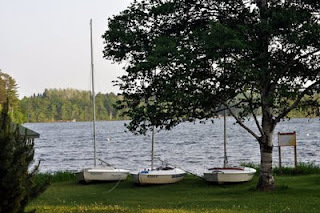 Many things at camp end up getting stored in random places... with sail boats stored in Mike Hall, canoes in cabins, and fun bugs in the lodge. And no, we didn't create a disc golf course with one hole... Jeff arrived at camp yesterday, one day early, in order to spend his day today putting the baskets in place through out camp. We're getting ready to set sail on another great summer! Okay, that was a little hokey... but thats life at camp. We are getting closer to getting the boats in the water, as you can see here. The Xboats were dragged out from their winter storage in Mike Hall a few days ago, and today new counselor Jon Ninneman and CIT Harrison Rosenthal spent some time getting much of our sailboat fleet set up with masts and booms in place. The rest of the sailing staff is going to owe them big time for doing much of the pre-camp dirty work. Our crew at camp continues to grow. Much of our kitchen staff has arrived over the past few days and, at the time of this writing, another five International counselors are on their way from Minneapolis after long flights from New Zealand and points in Europe. Tomorrow another dozen or so counselors will arrive in preparation for the start of our lifeguard training. Our trip leaders actually left camp today for the first of many scouting trips. They headed out on the Flambeau River. "What a guy could do..." That's one of the camp phrases made popular by our head caretaker Tom. 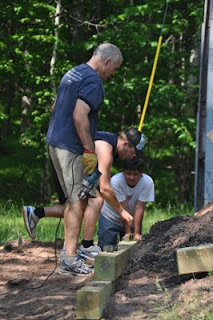 Today Leb decided to get down and dirty and head up a crew to build new retaining walls around our climbing wall. Here, Leb is being helped by maintenance assistant Nathan Skillings and new counselor Leighton Balemi. Back home in New Zealand, Leighton owns his own landscaping company. As Leb put it, Leb would do some work, then Leighton would politely chime in with some suggestions on "other ways he may want to do it". Needless to say, Leighton has taken over as project foreman, but the truth is that Leb loves working on projects like this! We have a new addition to the North Star fleet. This weekend we purchased a Master Craft ski boat to replace one of our Ski Nautiques. We got our first Ski Nautique in 1991 and over the years that boat amassed 2215 hours. The Master Craft has some great features that our other boats didn't have, including an instructional boom for our beginning skiers and a bladder that fills up water and creates a bigger wake for our wake boarders. So on a gorgeous Northwoods afternoon, with temps in the 70s and not a cloud in the sky, we decided that we had to take advantage of the weather and test out the boat. Andy, Vickie, (new counselor) Leighton and I took the first ski runs of the summer. We figured that when the boat got Andy out of the water with ease that we had made a great purchase. Here are some more pics of the boat! Not quite a blank canvas... this is what our tipi looks like before we put the canvas on it. By the time our campers arrive in just over two weeks, the tipi will look like... well a tipi, not just a pile of sticks. At the end of the summer we take the canvas down, store it, but leave the poles in place over the winter. They stay up all year long, then come mid June, Jeff McCormack and our CITs do some group bonding and lift the canvas into place. We actually purchased a new tipi canvas this past off season. Over the years, the canvas takes quite a beating with the northwoods weather. 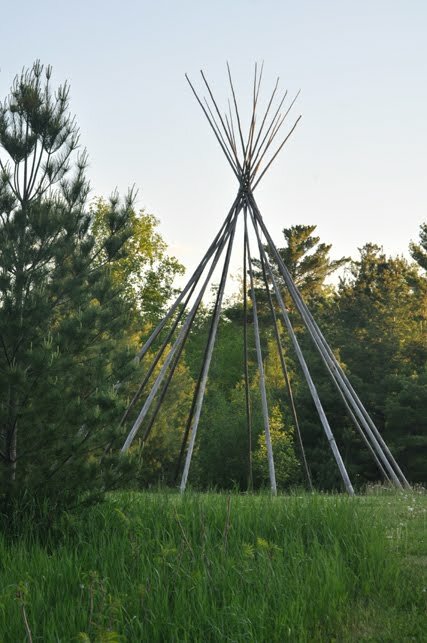 This is the third canvas that we've had for our tipi since the tipi was donated to North Star by campers and staff in celebration if North Star's 45th summer. Here are some more pics from the tipi. Special for this summer, we are having a one-time only offering of a North Star t-shirt and sweatshirt together for only $26. The shirts will be delivered to you at camp , but you must place your order by Wednesday, June 8th. Pictured below, the t-shirts are $9 each and the sweatshirts are $17, and are available in all sizes. We will deduct the order from your paycheck. Orders after the deadline may not be fulfilled. Over the course of pre-pre camp (that time before we actually start pre-camp staff training), I do my best to post a Picture of the Day. I'll try to snap a few pictures of what camp looks like as we get set-up or really anything that jumps out. This picture kind of came out of nowhere. 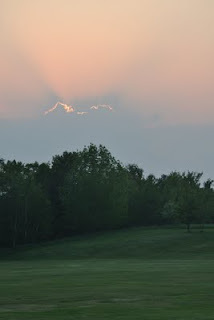 We had pretty thick cloud cover most of the afternoon and evening and some threats of rain. Late in the evening I took Murphy (my dog) for a walk down to swim point and as we were about half way down the path to swim point, the setting sun peaked out from behind the cloud. 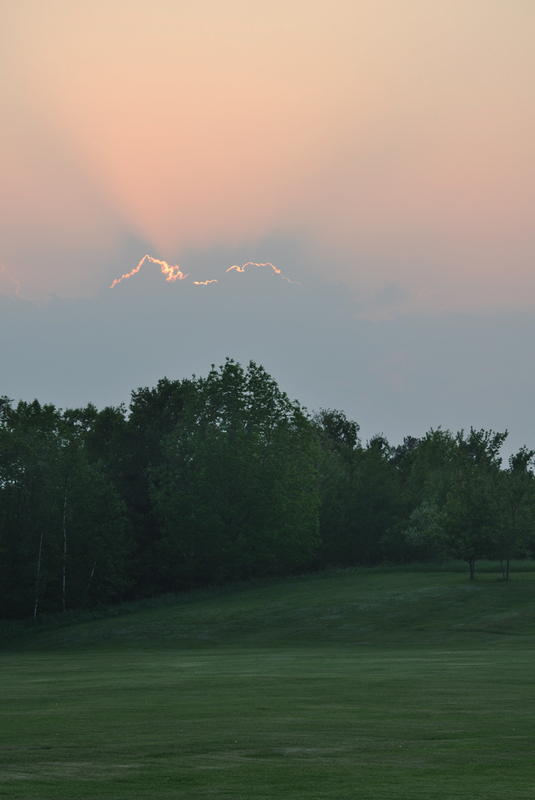 So here is the setting sun over Brewer's Bay. Since this is my inaugural 2011 PPCPOTD, I'll throw in a bonus shot. North Star camper Drew L was just finishing up his SCUBA diving certification when he got a surprising phone call. It was his SCUBA instructor who asked Drew if he was ready to be a star. And of course he was! Drew stood out in the interview process, and next thing he knew he was on a plane from his home in LA to Cancun, Mexico to film his first commercial. The commercial is being syndicated all around the country and the world as an advertisement for tourism in Cancun, with Drew as their poster boy. We can't wait to have the budding superstar back with us this summer! WE ARE EXCITED ABOUT THE UPCOMING SUMMER and look forward to the start of our *67th camping season! * This will be the final communication for 1st session and 8 week campers from camp before your son(s) arrive. Detailed travel instructions for 2nd session campers will be sent later. *Along with all of our other correspondence from camp during the summer will be by posting on our website at www.northstarcamp.com. The news updates can be found on "Leb's Ramblings," at www.northstarcamp.com/blog. It can also be found in the Media Room, which is in the Current Families section of the website. We will be utilizing Facebook and Twitter to let families know when there are new blog entries, summer pictures posted and other news bits. You can follow North Star on Facebook at facebook.com/northstarcampforboys and you can follow us on Twitter at twitter.com/northstarcamp. *IMPORTANT HEALTH ISSUES: *Please do not send your son to camp unless he is in 100% healthy condition. If you are at all doubtful, keep him home a few days longer. Under no circumstances should he come to camp if he has been significantly exposed to chickenpox or the Swine Flu. If you have any questions regarding this, please call camp. *WE ARE NOT ABLE TO GIVE ALLERGY INJECTIONS AT CAMP. * Campers will need to go to the clinic in town for these injections. This will require a short appointment in town to meet with our local physician prior to the first injection. There will be a clinic charge of about $70.00 and an injection fee of $26.00-$40.00 each visit depending on the number of injections. Since our local clinic is 20 minutes away we will take all campers with allergy injections on the same day. We are requesting that if allergy injections can be avoided during the summer that would be the best, however we will do our best to assist you if they are necessary. *MEDICATION* You must use Camp Meds if your son will be receiving medication at camp. Please contact them immediately if you have not done so already. You can find their contact information on your CampInTouch page. If your son brings medication to camp, please have him give it to the nurse when he arrives or you may give it to Leb in Chicago or Milwaukee. No medication will be allowed in the cabins. *BUS TRANSPORTATION: **CHICAGO:* The *CHICAGO* area boys should meet and report to the back parking lot of the Marriott Renaissance - 938 Skokie Blvd. at the corner of Dundee and Skokie Blvd. (right off the Eden's Expressway) at 7:30 A.M. on *Monday June 20th. * Please be prompt. Campers should bring a *bag lunch and drink. * Please use good judgment regarding the amount of food you send, only enough to be consumed on the bus. Any left over food and/or candy will be collected and disposed of when arriving at camp. On more than one occasion a camper has become ill on the bus because of an overdose of sweets. There will be several buses leaving from the Chicago area. All vehicles will stop in Milwaukee to pick-up the Milwaukee area campers. We do not have assigned seating and your son can take any bus. I will be on the bus. Chicago baggage will be brought to camp with the kids. Bring your sons' baggage to the bus stop and we will load it on a truck for transport to camp. Be sure that the baggage is properly labeled. *MILWAUKEE* area campers should meet with baggage on *Monday, June 20th* at 9:15 A.M. at the K-Mart Shopping Center on South 27th Street, one block South of I-94. Please be prompt. Go West on I-894, off I-94 to the South Street exit. Park north of the K-Mart sign on South 27 th Street. The reason we stop on the South side of Milwaukee is that the bus route we take to camp is I-94 through Milwaukee and past Madison. To come into the north shore would be a long detour for the buses. Campers should bring* a bag lunch and drink. * Leb will be on the bus. *BOYS FLYING INTO MINNEAPOLIS -- VERY IMPORTANT INFO!!! * The only way that we can guarantee meeting your son at the arrival gate in Minneapolis is if you participate in the unaccompanied minor program. You sign up for this with the airline. Airlines allow up to four individuals to fly on one Unaccompanied Minor reservation, so coordinating with others in your city can save you on the airline UM fee. We will be able to get gate passes for our staff if we have the name, flight information and confirmation number of the unaccompanied minor. *This information should be entered into the Transportation Form in the Campintouch system. The airlines will require the name and address of our staff member who will be meeting your son at the gate when you check your son in. We will email their name and information a day or so before June 20th. Please provide your son with enough money to purchase lunch at the airport as well as money for the return trip. This money should be put in his valuables storage when he arrives at camp. Dan Lichtenstein will be coordinating our Minneapolis travel arrangements. Airline baggage fees result in a wide variety of charges which can range from as little as $25 to over $100 per bag, depending on whether or not the airline agent decides to charge for oversized and overweight bags. We highly recommend that campers flying into Minneapolis ship their bags. It often ends up being cheaper and it definitely eliminates the hassle of dealing with the bags on both ends. We will send out a more comprehensive email detailing the process of shipping your baggage to camp. We will be mailing green North Star baggage tags to all families traveling from outside of the Chicago area. We ask that you attach these tags to any luggage that is being checked or your son is carrying-on. Boys who live in Minneapolis or who are being dropped off at the Minneapolis airport should meet a North Star staff member at the carpeted area across from Baggage claim area #13 (door #1) on the arrival Level of the Lindberg (main) Terminal at 12:00. Staff will be wearing gray North Star staff shirts. *If you are dropping your son off at camp,* try to arrive anytime after 3:00 p.m. This will ensure that your camper will not have down time before the other campers arriving around 4:00. After 3:00 p.m. our staff will be ready and able to give your son undivided attention. We recommend that first time campers take the bus to give them an opportunity to meet friends on the ride. *ARRIVAL AT CAMP: *No news is good news and your son will not call upon his arrival. He will send you a post card. (We will send an email indicating a safe arrival to all parents.) Please be aware that the mail to and from camp is very slow to some areas of the country. At times, it seems like it travels by Pony Express. Our mail carrier arrives after lunch. If your son writes a letter at rest period, it does not go out until the next day. It then travels to Hayward, trucks to Minneapolis where it is finally sent on its way. A slow process, so do not be discouraged by a lack of mail at the beginning of the summer. Do not forget to include your boy's name and cabin name once you know it when addressing letters to him at camp. We get some letters addressed only to North Star. We suggest that you send along with your son (especially younger boys), stamped, self-addressed envelopes. PICTURES and MESSAGES FROM CAMP: **You can now view our summer pictures through your CampInTouch account! *** We will continue to post pictures on our website and to post Leb's Ramblings. You can view the pictures by going to our website at www.northstarcamp.com and clicking "Login" in the upper right hand corner. Once you have logged in, click on "Photos" to see the summer pictures. You can create guest accounts for your friends and family to view the pictures by clicking "Guest Accounts" on your CampInTouch page. We will use Facebook and Twitter to notify families when new pictures are up or a new "Rambling" has been written. There may be times when I will send you an email so please make sure that we have your preferred email address. I truly believe you will want this service so please read the notice at the top of this letter. CAMP FORMS: The response in returning the various camp forms has been good. If you have not returned yours as of yet, you can access them on the Campintouch System. All forms are due June 1st. The Canadian permission forms with copies of birth certificates or pass ports are past due for boys having completed 9th grade. *CampInTouch* If you're wondering what CampInTouch is, it's your personalized access point to camp information. You can access it anytime by going to www.northstarcamp.com and clicking "login" in the upper right hand corner. You can also access it through Facebook by clicking on the CampInTouch tab on www.facebook.com/northstarcampforboys. From that page, you'll be able to access pictures, complete your forms, view the packing list, and more. *ELECTRONICS POLICY* NO VIDEO GAMES, LAPTOP COMPUTERS, iPads, iPhones or any CELL PHONES for that matter, (they don't work here anyways) or any kind of computer hand held games. iPods are allowed, but ONLY FOR MUSIC. We do not want our campers watching videos, playing video games, and we ask that you only send devices free of these things.We may choose to collect the devices and enable the password protected parental controls to prevent them from using these features. We will reverse this process at the end of the summer. Campers viewing videos on iPods or using applications, email or the internet will have their iPods confiscated for the remainder of the summer. We take no responsibility for lost iPods or other electronics. Many campers do not bring any iPods or other electronics, and we welcome you to avoid the hassle by leaving them at home. Also, please do not send squirt guns. Electric fans are not permitted, battery powered fans are acceptable. 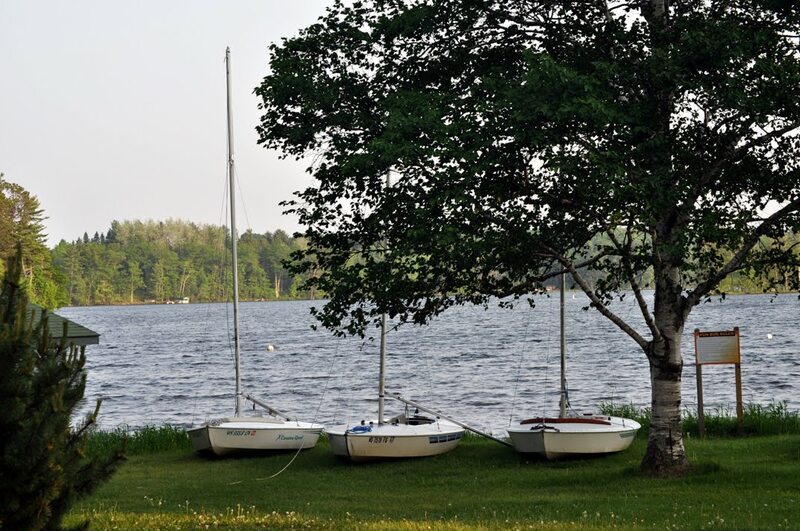 *POLICY REGARDING PERSONAL PROPERTY* If a camper damages another campers, staff or camp property due to his negligence it is expected that the camper will be responsible for payment or repair. *GEAR FOR CAMP* It is not too late to purchase all your camp gear on-line at our camp web store. Almost everything you need is there including sleeping bags, NSC logo gear, duffel bags, camp linens, etc. You can view the items by going to our website at www.cloz.com/northstarcamp. We have no control over the shipping date. If you have any questions or concerns regarding any aspect of camp, please do not hesitate to call. The entire North Star community is looking forward to an exciting and wonderful summer.